Make some cookies! 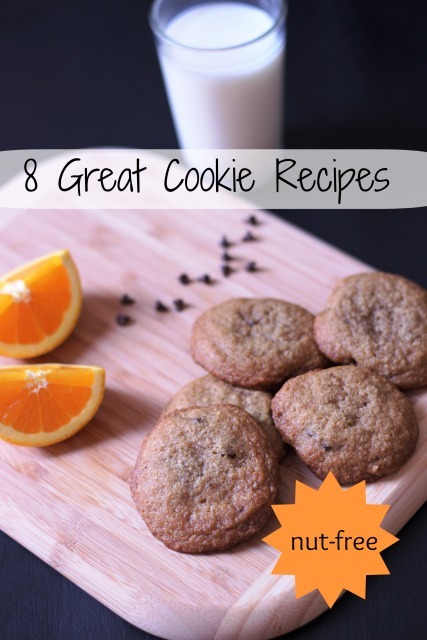 Try one of these 8 great recipes that your family will love. Cookies have been on my mind lately. Have you ever seen the movie Stranger than Fiction? (That’s an affiliate link*, by the way.) It’s one of those movies that proves to you Will Ferrell isn’t the huge cad he appears to be in the 99.5% of the movies he makes. We watched it as a family and were really taken with the beauty and mystery of the story. Basically, he’s an IRS agent who lives a pretty boring life. He doesn’t know it, but his life is being narrated — and therefore directed by the lovely Emma Thompson. He falls in love with a baker while auditing her. She offers him a cookie. She’s appalled. He’s clearly never had one of her cookies. And they’re really good cookies. You can go watch the clip here. Then go watch the movie — we borrowed it from the library. But, first bake some cookies! Cookies don’t have to be a complicated affair. My guess is that you can mix up a batch of dough in about ten minutes. Take another twenty to bake. Then enjoy a glass of milk, like Harold Crick, with a still-warm-from-the-oven cookie. If you’re really on the ball, take a few simple steps to make cookies a little more convenient. 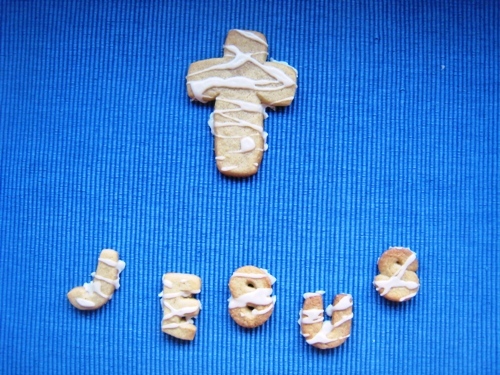 This is my family’s very favorite cookie that we make in abundance at Christmas time. 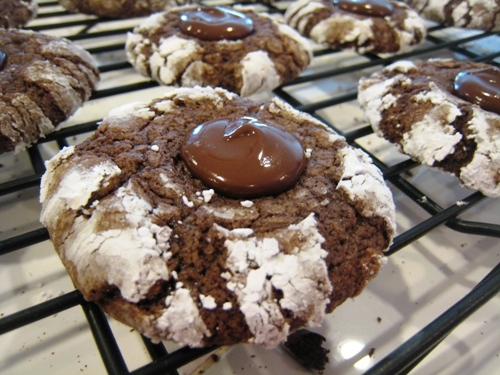 If I want to send my children and husband over the moon with glee, I just need to make these cookies. 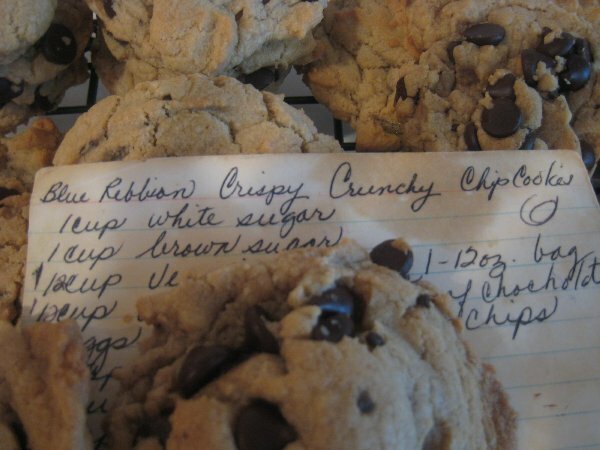 My Gramma John won blue ribbons at the county fair every year with this cookie recipe. It’s a family heirloom. Someday I’ll take some better pictures. Cough. Cough. 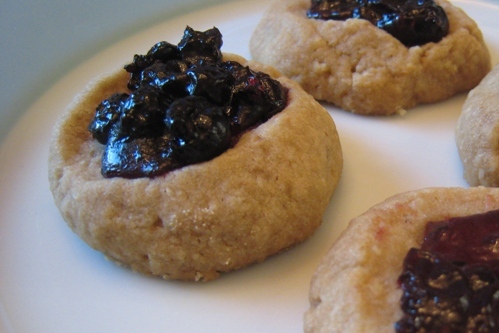 I love the traditional thumbprint cookies with nuts in the dough, but since my girl can’t have nuts, I developed this recipe that features oats. 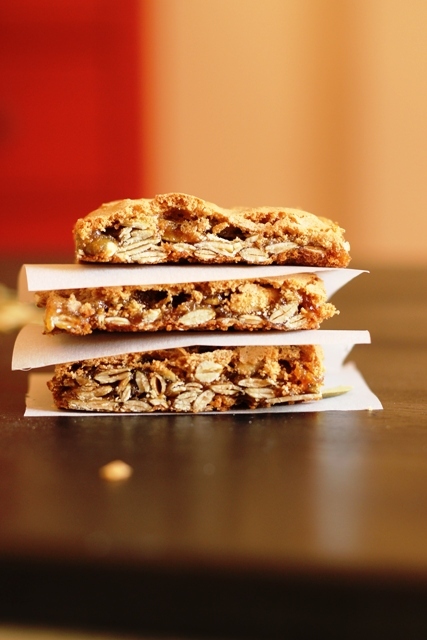 They add a little extra texture and a slight nuttiness that helps replace the nuts. You can fill them with your favorite jam, but I love cassis. My mom has a favorite gingerbread recipe. It has never ever worked for me as cut-outs, so I finally gave up. Now, I take the same dough and make crinkles. These are delicious and old fashioned and simple. For a time, my girl was deemed allergic to eggs. 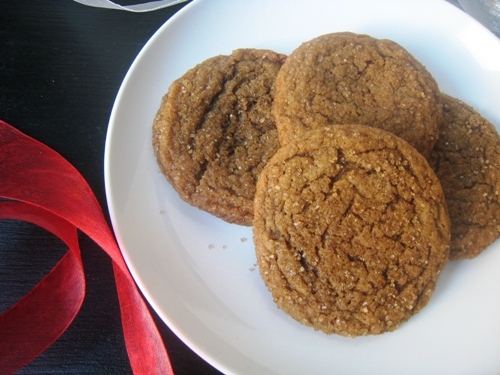 I was thrilled to find a vintage recipe for oatmeal cookies that was egg-free. This is one of my adaptations of that simple egg-free recipe. A few years ago I wanted a simple and sweet sugar cut-out. This cinnamon flavored version was what I landed on. We make Easter-themed cut-outs each Spring. My mom grew up making Walnut Bars. Since I can’t make those, I subbed in pepitas (pumpkin seeds) to great success. These cookies are addicting. So, so yummy. Could not sleep last night so I got on the computer and checked out a few things, one of them this site. After baking so many cookies at Christmas time, it’s been a while since I baked more of them. But seeing the video has prompted me into wanting to bake more right after Easter. Thank you for posting some clips of Stranger than Fiction. I watched it and it seems so sad; I’m not sure I would like to watch this movie because I don’t like tear jerkers. But in the scene where she’s trying to get him to eat cookies, that’s where I was enticed to bake some. On another note, I wanted to let you know that I finally emptied out all of the contents of our freezer; we have finally finished everything and this week, I actually had to buy some meat. Your January pantry challenge really got me motivated and I’m looking forward to the one in July. I started living out of the freezer in October and it’s taken me till April to finally empty it! Can you imagine? Six months worth of food in a freezer where the owner only lives five minutes from two grocery stores!! NEVER AGAIN!!!!!!!!!! Anyway, I just wanted to say hello and I hope everything is well with your family. Have a great day! Congratulations, Stephanie! It’s so wonderful what progress you’ve made. Thank you so much for sharing your journey with us. It really is amazing. Also, the movie is sad but funny and bittersweet, and it does end up all right in a surprising way. You might like it. Congrats on finally getting it emptied! That was an enormous undertaking for you. I’m sure you have a great feeling of accomplishment. I love Emma Thompson, so I saw that movies ages ago. My tween at the time loved it, and we’ve seen it several times since (either from library or playing on TV) and he still finds it enjoyable. It definitely falls in the “quirky” category. Hi Sandy; thanks for the reply. It certainly was an “undertaking”; one that I will never return to. I learned some great lessons throughout like not to fill the freezer with anything and everything I can just because things are on sale. Those items will always be on sale again and it’s better to just eat what we have rather than to keep on adding to the supply. And you have no idea how good it feels to be done with all of this. :) See you at the July challenge. Have you seen The Secret Life of Walter Mitty? (the new one) We really liked that. Kinda falls in the same category. I have been without a stand mixer for a few years now. Someone I work with received a Kitchen Aid for Christmas, so she brought me her old one that is in perfect condition 🙂 I plan to use it to once again make homemade goodies. (Another lady brought me her bread machine. She said that she had moved twice and it had not been used at either house!) I am a blessed woman. With all the attention being given to added preservatives and such, I rarely buy pre-packaged baked goods anymore. It is too easy to make our own and it is much healthier. Yay! What wonderful gifts! You are gonna be baking people happy….